We are trying to get a quote for injection molding of a part. We were told that they needed STEP files, so I converted the STL into a STEP, but now they say that this is inadequate. Here is what they have to say. 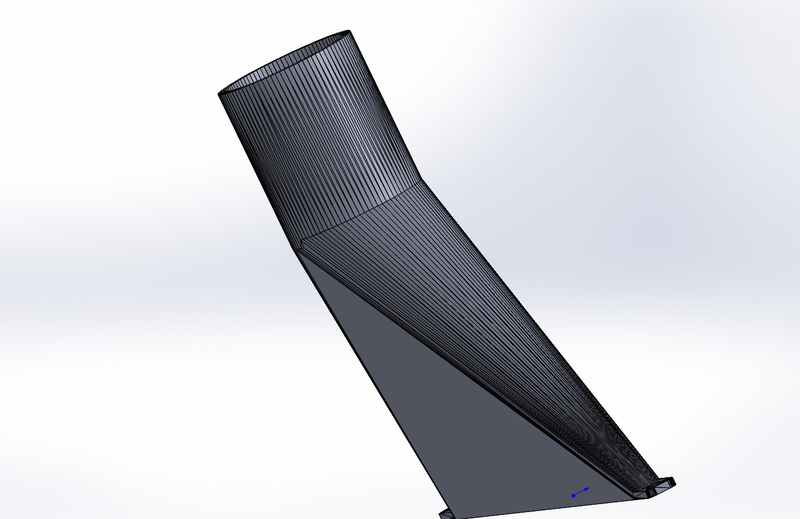 Any thoughts about how to satisfy them (short of paying someone to re-design the part from scratch in a CAD program)? Is this a problem that other OpenSCAD users have faced, or expect to face in the future? We received your request for quote, but we cannot process an STL-based or mesh file. We require surface model files, generated directly from a native CAD format. Saving a part in STL format deletes some of the information that we require. We can work with the following file formats: native SolidWorks (.sldprt) and ProE (.prt) files; files from other CAD systems output in IGES (.igs), STEP (.stp), Parasolid (.x_t or .x_b), ACIS (.sat); and AutoCAD (.ipt and .dwg, 3D only). As I have SolidWorks, I searched and found a set of simple instructions to accomplish your task. SW will import an STL file which is converted to solid body during the import process. From there, it's a simple matter to either save it as the .SLDPRT format or any other supported type. I also found during this search a set of similar steps to be performed using FreeCAD, which one might consider if the output format of that program meets your requirements. If you seen Blender or Meshmixer displays of a part, you'd easily recognize the SW conversion, although I suspect the triangles of SW, Blender and Meshmixer are mostly ignored by the vendor for your application. My best luck with getting STEP files from OpenSCAD is to first import the SCAD file into FreeCAD and then export to STEP. Note that FreeCAD does not support some features of OpenSCAD, and that it often takes a fair bit of work to get things working right with FreeCAD. You absolutely cannot use these modules: offset, minkowski, hull or projection find another way to model things if you do. Start slowly with your exporting and importing into FreeCAD. Do it one part or module at a time, starting with something simple that works. If you have many parts, export them one at a time, starting with the simple ones. FreeCAD can take a very long time to import an OpenSCAD model. Don't assume that it has crashed just because it takes 10 minutes with no progress indicator. Thanks. I used the FreeCAD procedure to produce the STEP file that the vendor says they cannot use. If you read what they say, it reads, in part, "[must be] generated directly from a native CAD format. Saving a part in STL format deletes some of the information that we require." My point is that I may not be the only person who will eventually trip on this step. save it as the .SLDPRT format or any other supported type. Meshmixer are mostly ignored by the vendor for your application. I had no idea that FreeCAD could import OpenSCAD. Of course, as it turns out, it cannot. You need to download some DXF libraries. And the procedure to do that is ASTONISHINGLY long and complex. I gave up. Maybe some other day. Thanks for explaining that this alternative exists: I did not know about it! Sorry, I left out something important. When you export into FreeCAD, you export from OpenSCAD as CSG, not STL. There is a huge difference between these, and using CSG will result in native CAD primitives that can be used. > part in STL format deletes some of the information that we require." You have been very helpful, but FreeCAD keeps telling me that the DXF libraries need to be installed (even when opening a CSG file), and that appears to be a Herculean task. I do not understand why the automatic install fails, but it does. - a triangulated mesh file is not able to be used by them to machine your part. - they want a solid model constructed from solid primitives. Of course you should validate with them that this is correct. I believe Solidworks might have such a tool but AFAIK it's an open problem to convert an arbitrary mesh to a booleaned set of solid primitives. AFAIK this hasn't been solved yet. But I'm happy to accept solidworks has a solution. So what they are saying they want - is a model in STEP format comprised of solids. OpenSCAD has no STEP exporter. FreeCAD - do not know but suspect you would have to remodel in this, or any of the other suitable CAD packages. The FreeCAD openSCAD importer does look like it does the right thing but as other commenters have said - you can't use the more idiosyncratic prims like hull. Must be straight solid prims and boolean ops only. OK. just tried the procedure using FreeCAD - works remarkably well. 1. Loaded the openscad file into openscad and saved as csg. 2. Downloaded freecad 0.15 - I'm on windows - can't speak for other platforms. 4. Edited preferences and under Openscad - told it where the openscad binary was. Resulting stp file is indeed made of primitives and not a polygon mesh. High probability this would convert OK.
@jon_bondy if you can't get it to work - PM me and I'll have a go for you. > OK. just tried the procedure using FreeCAD - works remarkably well. > 1. Loaded the openscad file into openscad and saved as csg. > Resulting stp file is indeed made of primitives and not a polygon mesh. > High probability this would convert OK.
> @jon_bondy if you can't get it to work - PM me and I'll have a go for you. > Thanks SO much! I will get back to you once I've had time to repeat your steps! It would be interesting to learn what specific subset of STEP they support. If you know anything about which software they use on their end to import these files, we could take note of that in future documentation. What is the definition of a "real" solid here? Does OpenScad even have them to export? It works with polyhedra and when they are manifold the STL files doesn't lose anything anyway. > What is the definition of a "real" solid here? > Does OpenScad even have them to export? > STL files doesn't lose anything anyway. defined results in some circumstances. solids kernels which resolve all questions for interesctions etc. >> What is the definition of a "real" solid here? >> Does OpenScad even have them to export? >> STL files doesn't lose anything anyway. Well you are never going to get that out of OpenScad because it converts to polyhedra before doing any operations and a lot of designs generate their own polyhedra programmatically. E.g. Calculating a tangent so the forces on a tool path can be calculated. A collection of polygons does not have a "smooth" (yes I know) result so interpolation algorithms and other aspects give ill defined results in some circumstances. So the CAD systems have defined a number of primitives which have well exercised and resolved solutions to all of the manipulations they want to do. OpenCASCADE, Solidworks, ProE, ACIS have what they refer to as solids kernels which resolve all questions for interesctions etc. Polygons make poor long path trajectories for entities like an Arc because they approximate an Arc, whereas one of the Arc representations will produce a smooth curve at CAM toolpath time, or Forces at simulation time. so forget words like "real" solids etc etc. Its a pragmatic reduced set of well exercised parametric, math based, solid curve and surface representations that they need. What is the definition of a "real" solid here? FreeCAD uses OpenCasCade I think. I am guessing a "real" solid would mean a native CAD geometry/topology model with separate geometry (point,curve,surface and more) and topology (vertex,edge,face,body and more), like you have in OpenCasCade or ACIS. I have used both in the past, but I am more familiar with ACIS. I guess in practical terms a "real" solid could be exported like a STEP (AP214?) or an ACIS .sat file. The difference from OpenSCAD is that these model representations are not polyhedron based. In ACIS a solid would correspond to a BODY or a LUMP. Does OpenScad even have them to export? STL files doesn't lose anything anyway. It will not work in general to convert from any mesh based representation into OpenCasCade or ACIS, as the model representations are very different.